Though the “Age of Fighting Sail” ended around 1840 as regards major warships, small sailing craft were to play a very important role in World War 1 in Britain’s battle against Germany’s U-Boats. 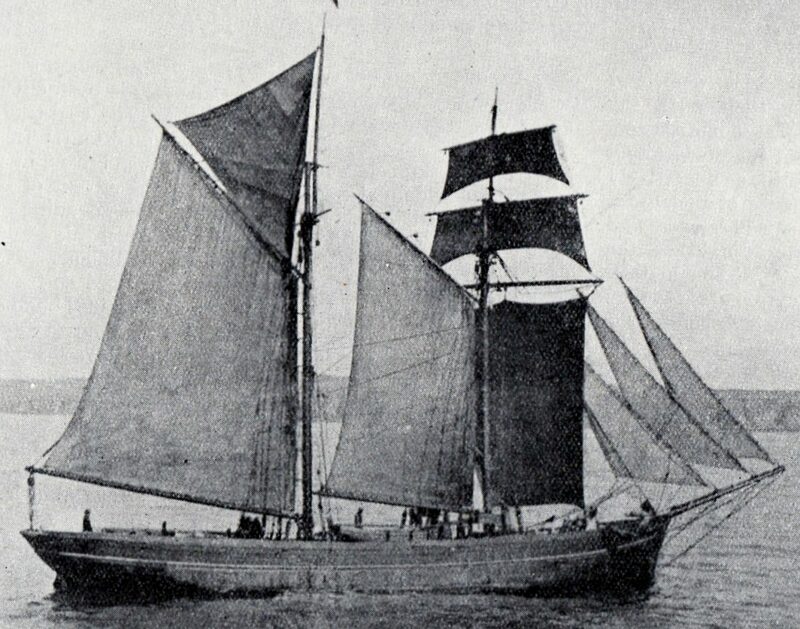 One such heroine craft was the Lowestoft fishing smack Telesia, which was conscripted into naval service. 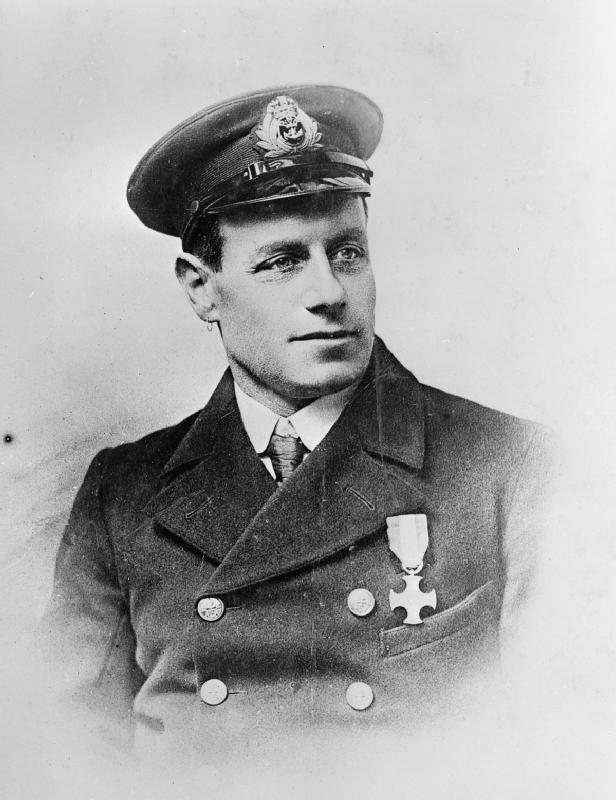 A hero of this campaign was Skipper Thomas Crisp VC (1876 – 1917). The following may give some flavour of what such warfare involved for such men, and such vessels. The mental image that most of us have of sinkings of British merchant shipping by German submarines, U-Boats, in World War 1 is by means of torpedoes. This was to a great extent a last resort however. Only limited numbers of torpedoes could be carried in the small submarines of the time and as such were to be reserved for large targets. In this period a major portion of all seaborne freight was carried in small vessels, many of them still sailing craft. Until Britain’s introduction the convoy system in 1917 all merchant ships sailed individually. Encountered alone on an empty sea, and almost certainly without radio (an innovation confined to warships and larger merchantmen) a small ship could be approached with impunity by a surfaced U-Boat. Gunfire could then be used to sink her or, even more economically, she could be boarded so that explosive charges could be placed below the waterline. The names of the myriad of humble fishing and trading craft sunk by U-Boats are largely forgotten today, in contrast to major losses such as the Lusitania that live on in the public memory. For much of the war Germany refrained from unrestricted submarine warfare and internationally-accepted “Prize Rules” were applied, these dating, scarcely modified, from the age of fighting sail. These stated that passenger ships could not be sunk, that crews of merchant ships must be placed in safety before their ships were sunk (life boats were not considered a place of safety unless close to land) and only warships and merchant ships that are a threat to the attacker migth be sunk without warning. Germany’s surface raiders – notably the SMS Emden – applied these rules scrupulously and so too did the U-Boats for a major portion of the war. Departure from these rules was ultimately to trigger American entry. Anti-submarine technology was also in its infancy. Only limited progress had been made on detection methods – Sonar, or in British parlance, Asdic, would only become effective after the end of hostilities – and without them the use of the primitive depth charges of the time was likely to be ineffective. The most likely method of destroying a U-Boat was to catch her on the surface and to finish her by gunfire or ramming. The challenge was therefore to lure the U-Boat to the surface. Observance of the “Prize Rules” was to make U-Boats vulnerable to being trapped by apparently innocent-looking merchant or fishing craft which carried concealed weaponry. These would sail under merchant colours and a naval ensign was to be run up only when the U-Boat was sufficiently close to allow fire to be directed on her. The crews wore civilian clothes and in many cases a “panic party” would drop a boat and row frantically away from the ship as the surfaced U-Boat approached so as to allay suspicion. A hidden crew would however remain on board and once the U-Boat was in point-blank range screens and other disguises would be dropped to allow the guns to be brought to bear. 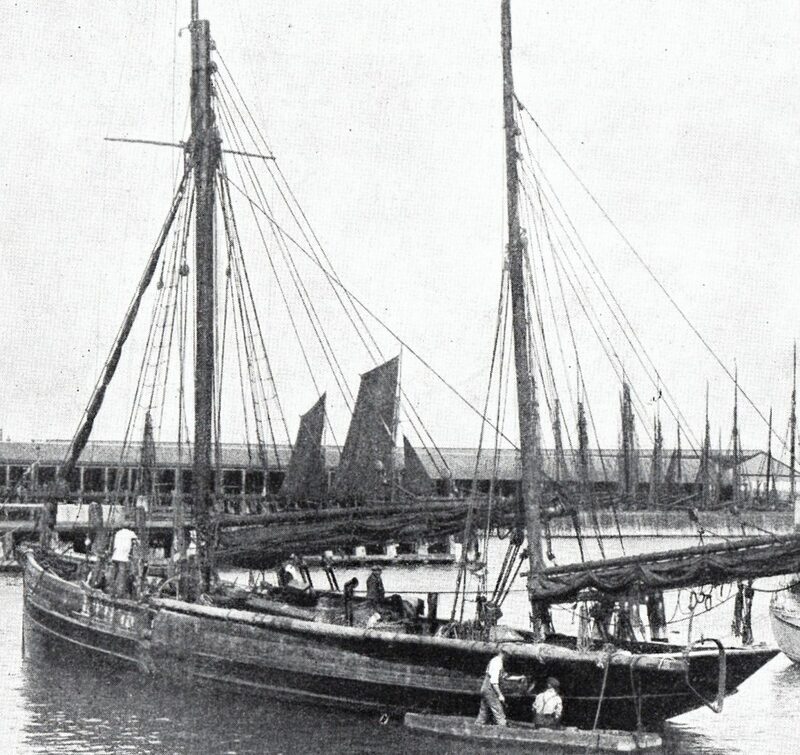 These vessels were known to the British as “Q-ships”, taking their initial letter from Queenstown (now Cobh), the port in the South of Ireland were most were based. The Q-ship would typically cruise in areas where U-Boats were believed to operate. She would often be packed with light wood or cork so that even if torpedoed she would remain afloat, encouraging the U-Boat to surface and sink her with a deck gun. The Q-Ship’s appearance might be changed frequently, by painting or by erection of dummy funnels and deckhouses, to deter suspicion of the same merchant vessel being seen too frequently in the same area. Crews were made up of a combination of serving Royal Navy personnel and reservists. A total of 193 Q-ships were commissioned during the war, of which 38 were sunk. 51 of the total were fishing vessels, of which 11 were lost. The typical Q-Ship – and “typical” is a loose term in this case, as no two were identical – was a small tramp steamer, sometimes very heavily armed and ideal for operation in the Atlantic shipping lanes to the south and west of Britain and Ireland where larger U-Boats would operate. The challenge was different in the North Sea where fishing, from sailing smacks as well as powered vessels, provided important food supplies. From mid-1915 small, 90-ft long, UB and UC-class German coastal U-Boats, were active in this area, typically carrying only two torpedoes and eight mines, plus a deck-gun for surface use. 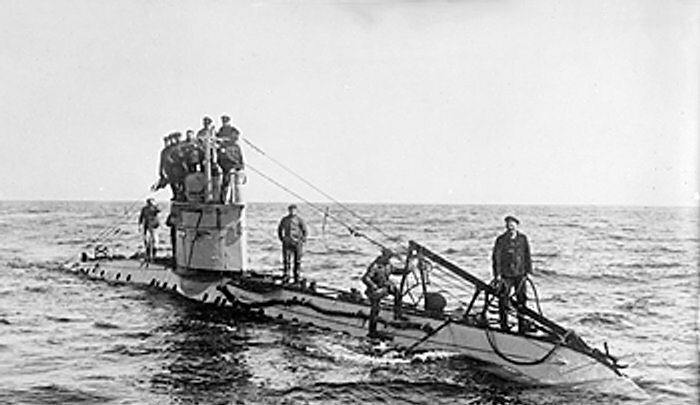 Besides being suited to mining British inshore waters they represented a significant threat to fishing craft – an example being three smacks from Lowestoft being sunk, after boarding by U-Boat personnel, in two days in early June 1915. The response was to arm four fishing craft as Q-ships. The first success was by the unpowered sailing smack Inverlyon which was armed only with a single 3 pounder gun. Approached on the surface by the German UB-4 near Great Yarmouth on August 15th 1915, the Inverlyon pumped nine rounds into her at close range, sinking her with the loss of all hands. It is impressive to record that, as the UB-4 sunk, the Inverlyon’sfishing skipper, a man named Phillips, dived in to attempt to rescue, unsuccessfully, a German crewman in the water. Further such battles were to follow, including a second, though inconclusive, action involving the Inverlyon. Despite this the German threat was to continue. The relentless pace of duty for these ships can be illustrated by reference to the armed Lowestoft smack Telesia. No less than six fishing craft had been boarded and sunk by explosive charges early in March 1916 and the Telesia’s crew was inevitably alert. 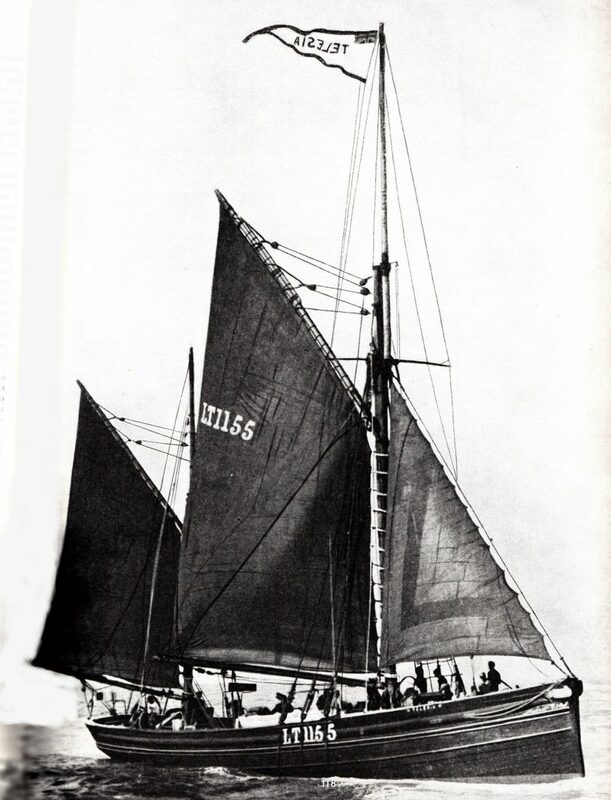 On March 23rd 1916 the Telesia was simulating trawling some 35 miles E.E. of Lowestoft. A U-Boat approached at 1330 hrs, made a cautious inspection, and came within fifty feet of her bows. The Telesia’s crew kept their nerve and maintained the pretence. For some inexplicable reason the U-Boat commander submerged to periscope depth and disappeared, returning an hour later for a further look. The submarine again disappeared but came back at 1630 hrs but remained submerged, though identified by her periscope. From 300 yards a torpedo was launched – a case of a sledgehammer deployed against a gnat – but it missed the Telesia’s bow by some four feet. Her skipper, Wharton, ordered the vessel’s three-pounder to open fire, lashing fifteen rounds at the periscope before the U-Boat disappeared. An hour later the U-Boat returned and she fired a second torpedo, which also missed, this time by forty feet, but surfacing immediately. As her conning tower was revealed the Telesia again opened fire, apparently scoring two non-fatal hits. The U-Boat now had had enough and she crash-dived so quickly that her propeller was revealed. She appeared to have headed back to her base on the Belgian coast. The aftermath of the action provided a salutary lesson. The wind fell. 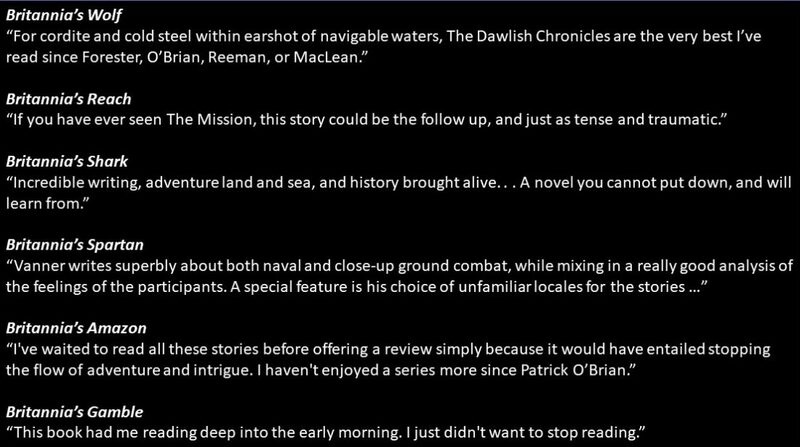 The Telesia was becalmed and she would have been a sitting target had she been taken under gunfire. It was decided thereafter that all Q-smacks would be thereafter be equipped with auxiliary oil engines. Telesia was again in action off the East Anglian coast a month later, on April 23rd, with her name changed to Hobbyhawk. She was now operating in company with a similar smack, the Cheero. In place of normal trawl nets these craft were towing 600 yards of nets with mines attached and this reduced their speed to 3 knots. They were now also equipped with rudimentary hydrophones, listening devices that could pick up the characteristic “whirring” sound of a submerged U-Boat running on electric motors. At 1900 hrs just such a sound was detected and both crews knew that a U-Boat was now stalking them. The tension must have been almost unbearable. 45 minutes passed, and then the Cheero’s towing wire suddenly went taut, then eased, then went taut again as if an enmeshed vessel below was fighting to free herself. An underwater explosion followed, throwing up a 20 ft plume and moments later there was a second, larger, explosion which left traces of oil on the surface. The hydrophones confirmed that the whirring had ceased but confirmation of the kill could only come when the net was hauled in. One of the net-mines had exploded and pieces of steel were entangled in the mesh. It was concluded that the second explosion resulted from detonation of the cargo of mines carried by the submarine herself. It later emerged that this vessel was UC-3. The Telesia/Hobbyhawk was to see yet more action less than a month later, on May 13th when she had a hot but indecisive battle with another U-Boat. 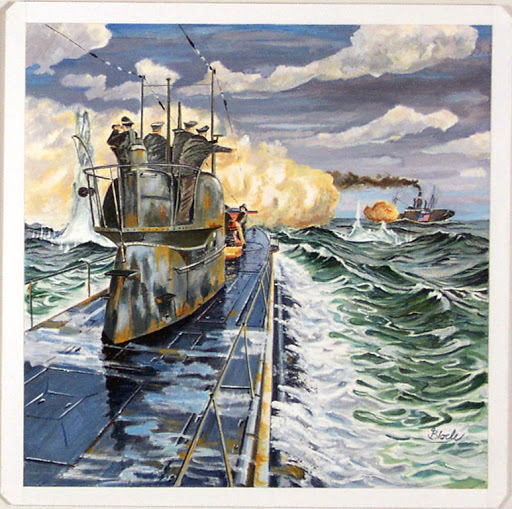 Other such vessels were to have equally dramatic encounters, all the more dangerous as the Germans became familiar with the tactics involved and as larger U-Boats replaced the UB and UC vessels. These were more heavily-armed, typically with a 4.1-in deck gun that outranged anything the smacks could carry. In retrospect it seems irresponsible to have kept the smacks in service and a particularly high price was to be paid in 1917 by the smacks Nelson and Ethel and Milly (a single vessel). On August 15th these craft were taken under fire by a U-Boat. Fire was returned – hopelessly in view of the range differences – and the Nelson was overwhelmed. Thomas Crisp, her skipper, was seriously wounded but he ordered resistance to continue as the vessel settled. With only five rounds remaining he ordered “Abandon Ship”, pigeons to be released with information on the position (a pigeon being the only form of communication available, as no radio was carried) and his son Tom to take charge of the ship’s boat. Crisp refused to be moved as he was too badly wounded – indeed in the message he dictated for the pigeons he stated “Skipper Killed”. He went down with his ship. The Ethel and Millie had also went down fighting and her seven-man crew were hauled aboard the German submarine, where the Nelson survivors last saw them standing in line being addressed by a German officer. They were never seen again, and controversy exists regarding their disappearance. 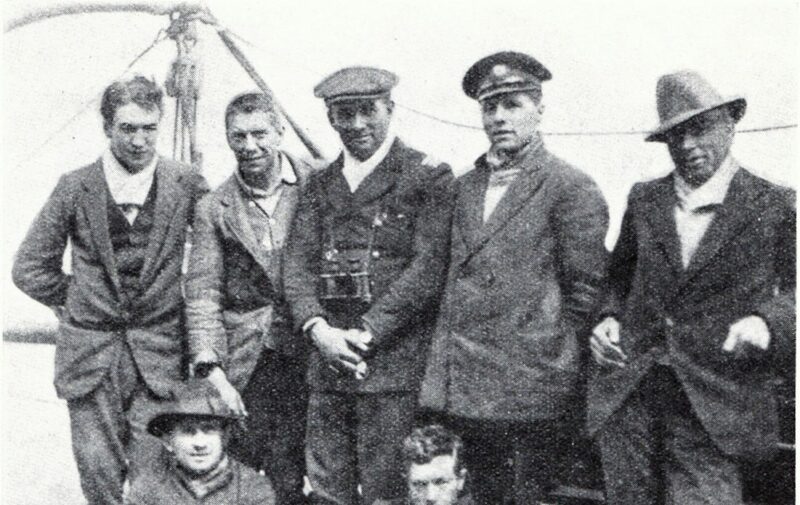 Opinion at the time was that they were murdered and dumped overboard by the German crew or abandoned at sea without supplies, but neither theory can be substantiated. Another possibility was that they were taken prisoner aboard the boat and killed when the submarine was herself sunk. The Nelson’s boat and her survivors were picked up by a British ship. Skipper Thomas Crisp was awarded a well-deserved posthumous Victoria Cross and his son received a Distinguished Service Medal. What has been described here is only a small part of the work undertaken by these tiny vessels and their indomitable crews. The courage and tenacity demanded of these men was of the highest degree and in pure economic terms the kills they achieved must have been the cheapest ever recorded in anti-submarine warfare. The smacks which survived the war returned to their normal peacetime pursuits. One of the last of these splendid vessels was the Telesia herself, which was still in service in 1935 when she was chosen to represent her home-port of Lowestoft at the Silver Jubilee Naval Review at Spithead.